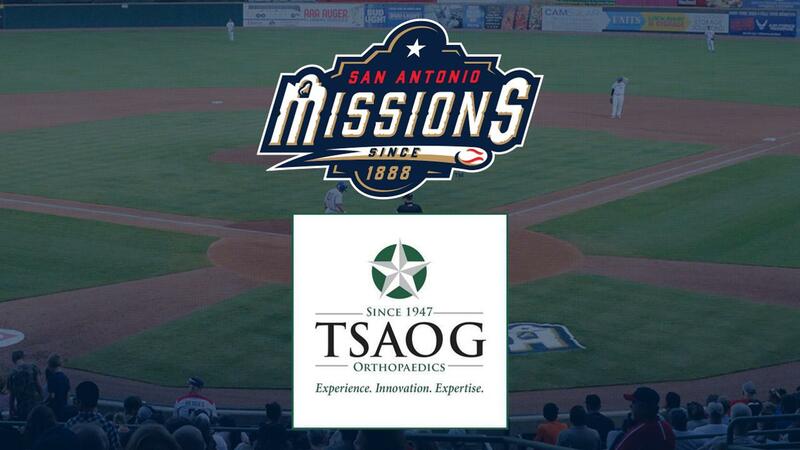 San Antonio - The San Antonio Missions announced today that TSAOG Orthopaedics (formerly the San Antonio Orthopaedic Group) will be the team's official healthcare provider through the 2021 season. "We are thrilled to be partnering with TSAOG," said Missions General Manager David Gasaway. "They have been a San Antonio institution for over 70 years and will work with us as we continue to give back to San Antonio and our fans." "TSAOG is very excited to serve as team physicians for the San Antonio Missions," said TSAOG sports medicine specialist Dr. Thomas DeBerardino. "Sports are a passion of mine and, as a surgeon, there is nothing better than helping an injured athelete return to play." -Serving as the exclusive partner of the 2019 Missions Rookie League. The Missions Rookie League is a Little League program for financially disadvantaged San Antonio youth, run in conjunction the San Antonio Police Athletic League, and supported by Missions CARE (the Missions' charity foundation). -Working with the Missions Youth Baseball Clinics. These clinics are hosted by Missions players and coaches to provide youth baseball players hands-on instructions on various aspects of the game. -Providing educational and instructional content for youth athletes and their parents on various topics including injury prevention and rehabilitation, concussion recognition and management, and the importance of nutrition to sports performance. "In addition to serving as the team physicians for the Missions, I'm grateful for the opportunity to work with the team on their youth sports initiatives," said TSAOG sports medicine specialist Dr. Christian Balldin. "Playing youth sports growing up helped shape me as I was maturing and gave me a passion for sports that has evolved into a career in sports medicine. Now, as a father of four, I appreciate the benefits these programs bring children, not just encouraging physical fitness, but fostering personal development." -About Dr. Thomas DeBerardino: Dr. DeBerardino is a board certified orthopaedic surgeon, fellowship trained in sports medicine, with TSAOG Orthopaedics. He served as Director of the West Point Sports Medicine Fellowship and Head Team Physician for Army Athletics before his retirement from the Army in 2009 at the rank of Colonel. Following his retirement, he spent seven years as an Associate Professor and Orthopaedic Team Physician for the Orthopaedic Surgery Department at the University of Connecticut Medical Center and the UCONN Athletic Department. -About Dr. Christian Balldin: Dr. Balldin is a board certified orthopaedic surgeon, fellowship trained in sports medicine, with TSAOG Orthopaedics. His previous team coverage experience includes the US Ski Team in Colorado, the San Antonio Talons, and the San Antonio Scorpions. He also serves as President of the Texas Society of Sports Medicine (TSSM).